The dramatic, rugged coast of North Cornwall offers much to the visitor, from its storm battered granite cliffs, to sandy beaches and a wealth of interesting towns and villages. The historic town of Bodmin was once the county town of Cornwall and is the only Cornish town to be recorded in the Domesday Book. The name is said to derive from the Cornish Bodminachau, meaning 'the town of the monks'. Bodmin's characterful streets boast a number of buildings of historic interest , including the Turret Clock, which marks the site of the ancient Butter Market, the Assize Hall, Shire Hall, which now serves as the tourist information centre and Bodmin Gaol, which has now been converted into a museum and is open to the public. Lanhydrock House, two and a half miles south of Bodmin and overlooking the richly wooded valley of the River Fowey, is the grandest and most popular stately home in the county of Cornwall, set in a 450 acre estate. Spectacular and atmospheric, thirteenth century Tintagel Castle (pictured right) stands on the site of an earlier Dark Age fort, reputed to have been the birthplace of the legendary King Arthur. The castle stands isolated on a rocky windswept headland rising around 100 metres from the sea, which is linked to the mainland by an ithmus of rock and surrounded on three sides by the Atlantic. The castle has long been linked with the tales of King Arthur since 1136, when Geoffrey of Monmouth wrote in his "History of the Kings of Britain" circa 1135-38 that the legendary King Arthur was conceived there. Later stories related that Arthur was born and even lived at Tintagel. 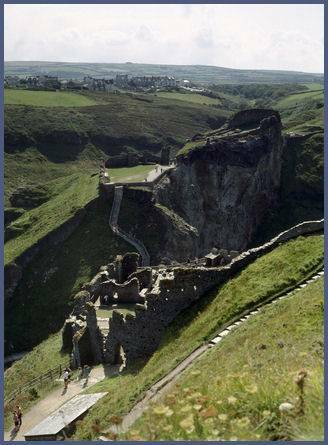 Local legend states a version that Merlin lived in a cave below the castle of Tintagel while King Arthur grew up. In one version of the legend, Arthur was found by Merlin washed ashore in a cave below the castle, now known as Merlin's Cave. (pictured above left) The poet Tennyson immortalized Merlin's Cave in his 'Idylls of the King', describing the waves bringing the infant Arthur to the shore and Merlin carrying him to the safety of the castle above. Characterful Tintagel village, a popular tourist destination, the quaint Tintagel Old Post Office, tumble-roofed and weathered by the centuries, was previously a medieval manor house, which was built in the late fourteenth or fifteenth century. The Old Post Office is now in the care of the National Trust, and is preserved as the Victorian post office that it became in its latter years. The nearby picturesque harbour of Boscastle, is another highly popular tourist destination, the village clings to the sides of the highly attractive Valency Valley, which is known for its connections to the West country author Thomas Hardy. The Museum of Witchcraft, which is housed in a characterful converted water mill, is home to the largest collection of witchcraft related articles in the world, which includes charms, spells, curses and even an assortment of broomsticks and cauldrons! 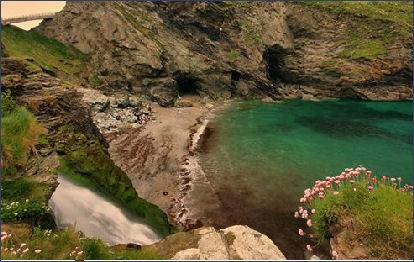 Beauty spots in North Cornwall include Rocky Valley, which lies near Bossiney around one mile east of Tintagel Castle. It is known in Cornish as Glynn Duwy, meaning the deep valley of the river Duwy. 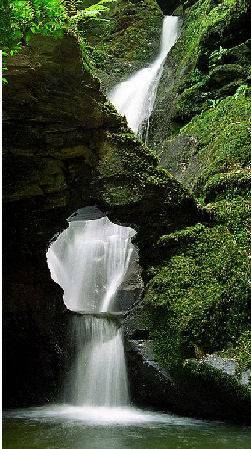 The valley has been carved out of the rock by the Trevillet River (In Cornish Duwy, meaning dark river) . At their highest point, the slate walls of the valley tower spectacularly over seventy feet above the river below. The stream starts it life high up on Venn Down, 820feet (250m) above sea level. From there it meanders through fields before tumbling dramatically, at the waterfalls at St. Nectan's Glen (left) where it plunges around 40 feet. Bude is a major surfing resort, boasting some of the best surfing beaches in Britain, including Summerleaze Beach, attended throughout the summer by a lifeguard and surrounded by a spectacular Heritage Coastline. Widemouth Bay lies a few miles south of the town and offers a long, wide sandy beach. The views from the storm battered granite headland of Trevose Head into Devon are magnificent. Part of the long South West Coastal Path, which stretches for 630 miles from Minehead on the edge of the Exmoor National Park along the coasts of Devon and Cornwall to Poole in Dorset. Trevose Head is the smallest of the Heritage Coasts along the route, measuring but two and a half miles, but it boasts some superb scenery and makes for an excellent setting for a short walk. The ancient town of Padstow, on the North Cornwall coast was originally referred to as Petrocstow, after Welsh missionary St. Petroc, who founded a monastery in on the site in the Dark Ages. Nestling on the Camel estuary, its winding streets slope down to the harbour. There are many quaint and characterful villages along Cornwall's North west coast including Crackington Haven, which name deives from the Cornish Porthkragen, which means cove of the little crag, Morwenstow, with its Norman church and Medieval St John's Well. Trebetherick, with its ancient village church of St. Enodoc, a former chapel-of-ease, which is situated in sand dunes and is the burial place of Poet Laureate John Betjemen. The characterful Cornish hamlet of Poundstock, situated four miles to the south of the town of Bude, boasts a medieval church and Poundstock Gildhouse, a unique structure is a well-preserved late medieval church housewhich is the only surviving example of its kind in Cornwall that is still used for its original purpose. It has been used continuously since it was built.